Source of protein. High in fibre. Suitable for vegetarians and vegans. Kosher - KLBD Pas Yisroel. Like crunching on these Rye Breads*, finally booking that trip you've always dreamed of, or just getting outside more. 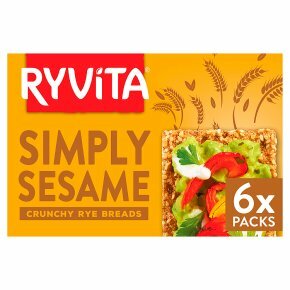 At Ryvita, we think rye is pretty special. It's rich in fibre, low in saturated fat and is a natural source of iron, magnesium & zinc. That's why our Crunchy Rye Breads are baked with Rye, to give you an easy way to get more Goodness* into your day. *This product is high in rye fibre. Rye fibre contributes to normal bowel function, when consumed as part of a balanced diet and healthy lifestyle. Feeling Creative? Why not try these Sesame Crunchy Rye Breads with Guacamle and mixed roasted peppers?